Road trips are the best way to unwind yourself and feel relaxed. Riding in the outskirts of the city while enjoying the countryside views and an array of hills accompanying you throughout makes the journey worthwhile. The city of Bengaluru has grown so much so that, it is overpopulated and noisy. That is when the road trips come in handy, and thankfully there are many tourist places within a distance of 200 kms from Bengaluru. Mekedatu or Mekedaatu is a tourist spot, situated in Kanakapura Taluk of Karnataka, around 194 km away from Bengaluru (Bangalore). 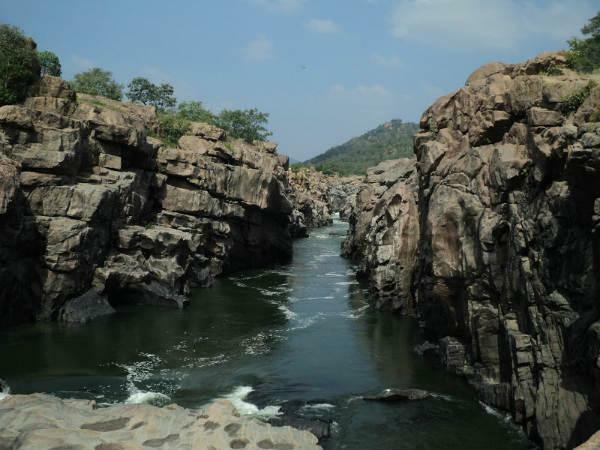 Here river Kaveri cascades through a narrow gorge. In Kannada language, 'Mekedaatu' means 'goat's leap', meaning a goat can easily jump on to the other bank. This tourist spot gets many visitors throughout the year. The most common and easy route is Bangalore-Kanakapura-Mekedatu. You have to take the Kanakapura main road and further continue via NH 948. The route passes through Kaggalipura - Jakkasandra - Kanakapura- Malavalli - Sargur - Mekedatu. Kanakapura road is very crowded these days, so be ready to face the traffic. The total distance to be covered is 194 km. The other route you can take is Bengaluru - Bidadi - Ramanagara - Maddur - Malavalli - Shivanasamudra - Mekedatu. This route passes through NH 275 and then joins NH 948 from Malavalli onwards. October to March is the best time to visit Mekedatu. In monsoon, the rocks are very slippery and therefore not advisable to visit. During the summer season, the river would have dried up. So the winter season is the ideal time to visit this destination. Buses are available only till Kanakapura. You will have to arrange for a private vehicle to reach Mekedatu from there. So, it is better to go in your own vehicles or hire vehicles for this trip. It is better to finish your breakfast before you leave the Kanakapura Road. There are big hotels like Adyar Ananda Bhavan and Vasudev Adigas near to the Konankunte cross. After that you won't find many good hotels on this road. You may find some decent hotels in Kanakapura. If you are taking the Ramanagara route then make a pit-stop at the Raasta cafe or Kamath Lokaruchi. Shivanasamudra Falls and Sangama are the top tourist attractions near Mekedatu. Apart from that, you can also visit Kallahalli Sri Srinivasa Temple in Kanakapura. Mekedatu is one of the best weekend getaways from Bengaluru. This serene place is perfect for a one day trip from the city. So, this weekend make a trip from Bangalore to Mekedatu for a memorable experience.